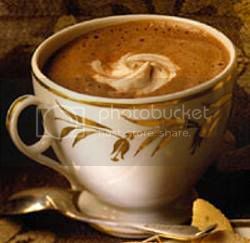 The movie, Chocolat includes a scene where the Juliette Binoche pours out a cup of thick decadent hot chocolate and puts a dollop of whipped cream and then sprinkles chili on it. Yeah baby that kind. Now there are two ways of making this puppy. The slow old fashioned way and I gotta have it NOW way. Heat water in a sauce pan and add cocoa, cinnamon, salt, chili powder and sugar cook and stir continually until smooth. Add the rest of the ingredients and heat through but don’t simmer or boil. Serve with a dollop of whipped cream and a sprinkle of cinnamon or chili powder on top. Dump the the first four ingredients into a dish and cook for one minute on high and then stir and nuke again for a minute stir again you make need to do a third time until hot and mixed thoroughly. Pour into cups and cover in whipped cream. This entry was posted on Tuesday, February 17th, 2009 and is filed under Baking & Cooking, Mountain Lake Resort.